The Sandford Bush Festival is a participatory celebration of bush & country living, and is made possible by generous sponsors, an army of dedicated energetic volunteers and a whole bunch of enthusiastic participants and spectators. Bush Ballads, Folk, Gospel and Bluegrass Music, Bush Poetry, Bush Crafts, Vanishing trades and Local Art are performed, exhibited and demonstrated by professionals, semi-professionals, amateurs and hopefuls including some very talented younger performers. Two or three paid professional entertainers are supported by a troupe of professionals and semi-professionals who donate their time and talents for free. 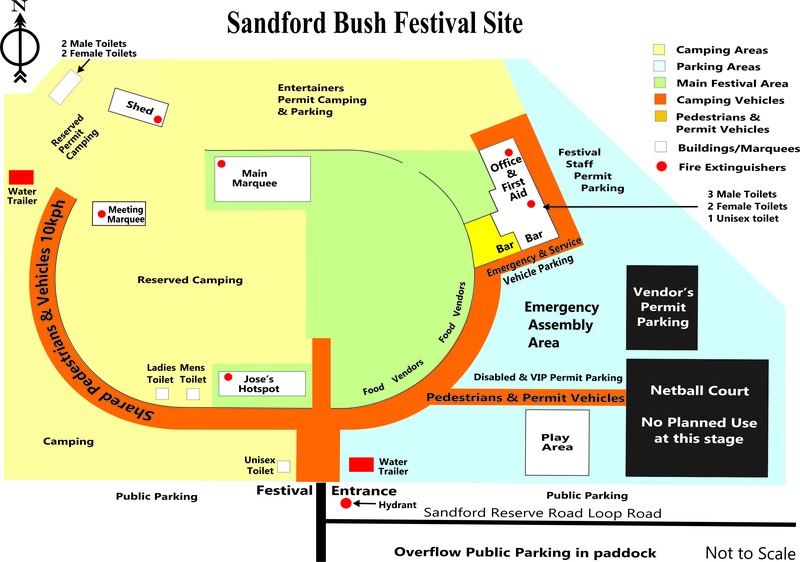 The Sandford Bush Festival is presented by the Stumpy Gully Bush Band which is a registered ‘Not for Profit’ organization. All profits are dispersed to local community groups, sporting clubs or charitable organizations. By road: Sandford Village, 5km South of Casterton in South Western Victoria is about five hours’ drive from Melbourne and Six hours from Adelaide. . . . . . The Recreation Reserve is about half a kilometre out of Sandford Village. On the labour day weekend it is generally a pleasant mid to high 20’s but can get up to the 30’s at times. It is usually dry but has been known to rain. . . . Be prepared. All under cover areas and the food precinct are Non-Smoking Zones. Alcohol at your camp site is your own affair but please do not bring alcohol onto the Festival site. The festival is a licensed event and operates it’s own bar serving a range of alcoholic drinks. Please patronise it but do drink sensibly! The bar is conducted strictly according to licensing regulations and to RSA principles, i.e. under-aged and intoxicated persons will not be served and no alcohol is to be taken outside licensed areas as shown on the sitemap. At the festival the licensed area is clearly marked by fencing, bunting and signage. Please observe the signs. Firearms, flares, fireworks, pyrotechnics or any type of explosives and illegal drugs are all banned from the festival and camping areas. Any person found in possession of banned items will be immediately evicted from the site and excluded from re-entry. All details of such action will be passed on to the Police. We all love dogs and naturally you love yours most of all. . . and that’s the way it should be. However, please keep yours on a lead at all times and away from the food service areas (including the vicinity of food vendors sites) and under-cover festival venues altogether. Makes life simpler for all. Thanks.